Well after months and months of planning and keeping it a little secret, I can finally reveal. So what is Our Little Place? in the areas of interior design, fashion, travel and lifestyle. Each and every book is carefully selected and each one has meaning. If I don't love the book, I won't have it in Our Little Place. and some words of knowledge they all look amazing in your home. but to make sure they look amazing in our homes - right? Like many of you I LOVE books, just adore. books are the best gift I can ever receive. Books allow me to get really lost in the world of interiors and fashion. Let me go on journey's to places I never been and I love it. It's me time to relax and dream. I can sit for hours flipping through books. Additionally to the book store, I've also started a book buying service for clients. or gorgeous limited and collectors editions. I will put a personal catalogue together just for you to start or build upon your collection. Need to buy a few gifts, I can help put a selection together for you also. to have in the store and many more categories. (yes, food is coming!) please let me know. 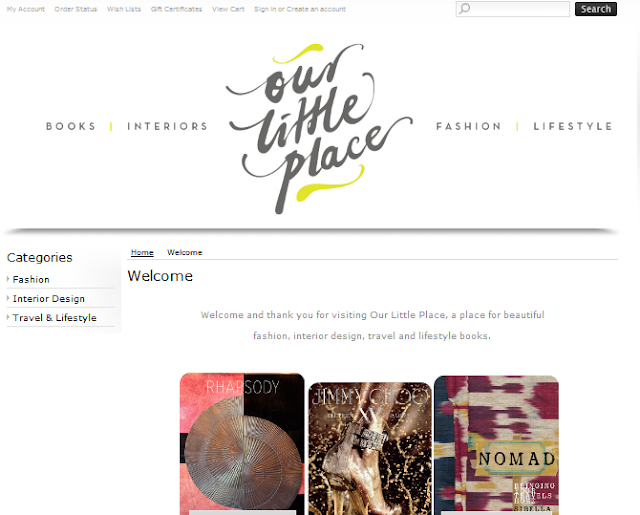 Please pop on over and visit Our Little Place to see what's in store. There will be a lot more to come and I can't wait to tell you more about the journey. and a big thank you to my friends and family who have supported me in my dream. Hi Sarah, I pop in often and love your Blog....especially that you are a fellow Perth girl Blogger is great. If you are interested I am happy to do a advertorial feature on my Blog directed at the design books you have on offer. I would just need a little about us blurb from you and you can link back to me on your Blog and Facebook. Always happy to help out new online businesses if possible. Can't wait to see your other suggestions on coffee table books. I'm a believer in not having everything on an computer, but having books you can still flip through and admire the beautiful photos inside.